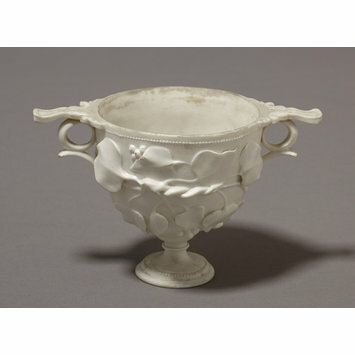 Cup of 'Parian ware,' modelled in relief. Semi-ovoid, with tall foot and two loop handles consisting of a vertical ring between two horizontal projections. The body is decorated with ivy-leaves and berries in high relief. 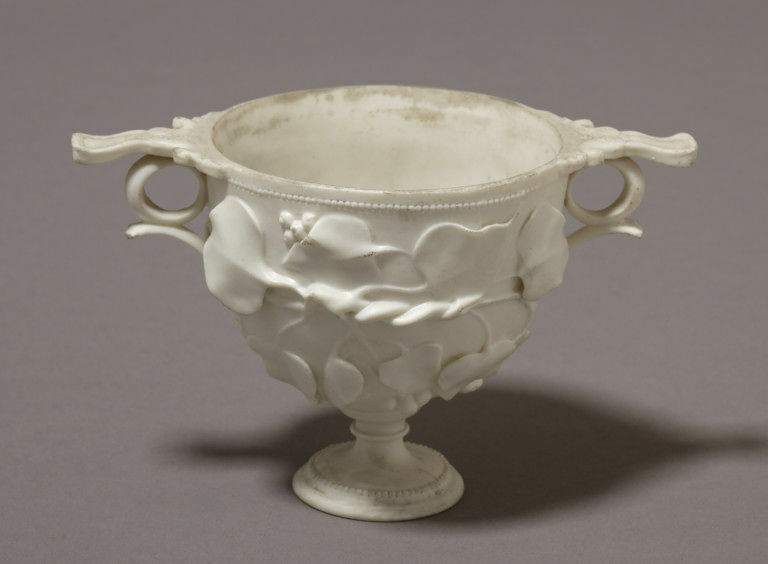 Made as a copy of an ancient Graeco-Roman silver cup, found at Pompeii, now in hte Naplese Museum. Obtained from the Great Exhibition of 1851. Transferred from the Museum of Practical Geology, Jermyn Street. Caracciolo, Maria Teresa., Gallo, Luigi., and Osanna, Massimo eds. Pompeii and Europe 1748-1943. Electa: Milan, 2015. ISBN: 9788891804365.